Attention chocolate lovers. 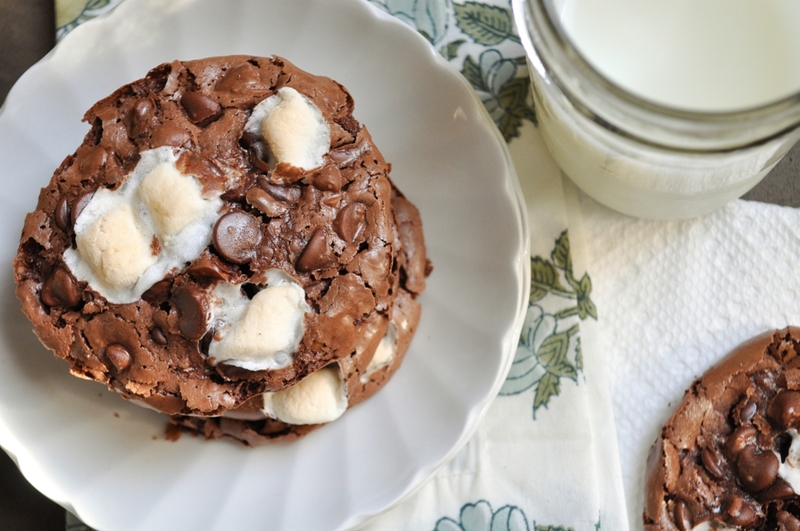 This ooey gooey rocky road cookie is for you. Grab a cold glass of milk to go alongside because this cookie is decadent. It's rich. It's uber chocolaty. In fact it's the most chocolaty cookie I've ever had...out-chocolating even this cookie. I'm not exaggerating...not even a little. This is serious chocolate business! Where did this amazingly delicious ooey gooey cookie come from? A fabulous (new to me) blog that I discovered through Secret Recipe Club. Before I tell you more about this fab blog, here's a little bit about Secret Recipe Club. Once a month Secret Recipe Club members are each assigned another member's blog. You check out your assigned blog, find a recipe, bake it or make it and then blog it. Your assignment is a "secret" until everyone reveals their posts on the same day and time. It's a great group, founded by Amanda Formaro of Amanda's Cookin' that grew from a dozen or so members to 300+ members in the past year. The group has gotten so large there's a waiting list to participate. If you are interested in joining, head over to the SRC site and check out the "Join SRC Section." I always look forward to SRC every month. It's fun to get your blog assignment and start browsing. Choosing which recipe to make is probably the hardest part! My problem is I usually find 3 or 4 or 10 I really want to make. That was no exception this month. I had the pleasure of being assigned Joanne's blog, Fifteen Spatulas. Fifteen Spatulas is beautiful blog containing an abundance of recipes, both savory and sweet and is named after her expansive collection of her favorite kitchen tool, the spatula. Joanne's blog is filled with what she calls scrapeworthy recipes. If her photos are any indication...they are indeed worthy of scraping your plate clean and possibly licking it too. I loved reading about Joanne's journey and I totally admire her for following her passion...food. To read about her story click here. Joanne's passion comes through in every aspect of her blog, from her gorgeous photos, to her detailed yet approachable recipe instructions. Joanne believes in teaching her readers the reason why a recipe calls for certain techniques and she even has a number of fun instructional videos. I went a little nuts and bookmarked 9 recipes I wanted to try. 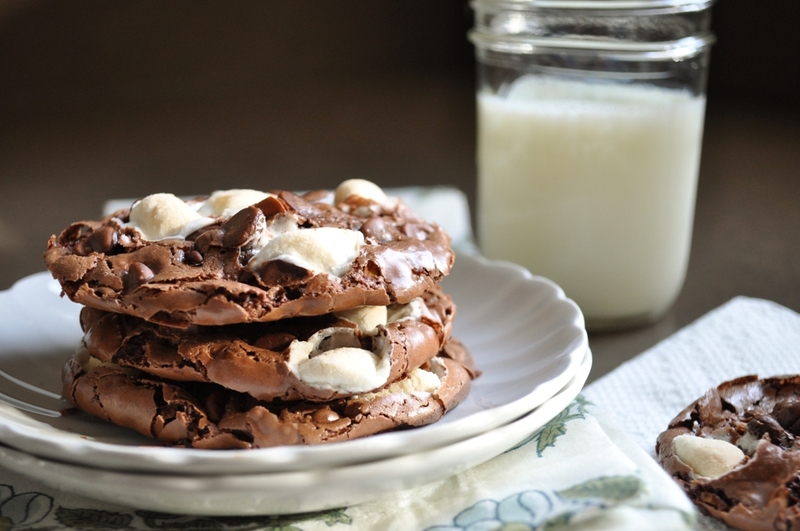 But this ooey gooey rocky road cookie recipe drew me in. Rocky road has always been a favorite ice cream flavor and the cookie version looked pretty stunning. With a fudgey flourless chocolate cookie base studded with toasted almonds and chocolate chips, topped with golden brown gooey marshmallows, I knew this cookie would be a winner. It has a crackly exterior and a positively gooey interior. Gooey is a good thing in my book. As stated previously, this cookie is not for the chocolate faint of heart. Luckily I'm a chocolate girl through and through. The dough/batter comes together easily. But I did I encounter a couple of issues in execution...I had trouble removing the cookies from the parchment paper once they were baked. This recipe has no fat (i.e., butter) in it which usually helps a cookie slide right off parchment paper. 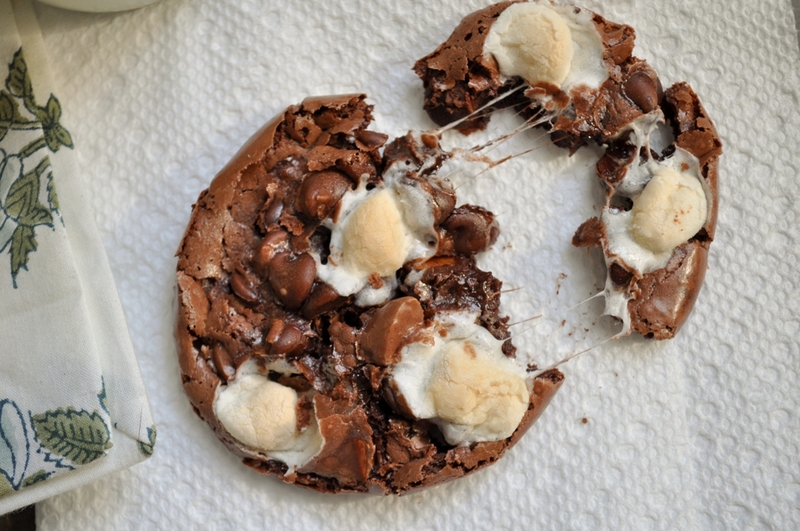 I think the gooey marshmallows melted down through the cookie and stuck to the paper. Next time I make these I will spray the parchment with non stick cooking spray. I also under baked the cookies the first go round. It was hard to tell they were under baked until they were cooled and I attempted to remove them from the baking sheet. When half the dough was raw on the underside, they had to take a trip back to the oven. Despite my challenges, the cookies still tasted fantastic. Did I mention these cookies are amazingly chocolaty? The almonds add a nice crunch and the marshmallows are pillows of sweet gooey goodness. Delish! I'm thinking these cookies would be great alongside vanilla ice cream. Oh, and I almost forgot to mention Joanne's has a great video on how to make these cookies. Click here to check it out. Preheat oven to 350 degrees and line 2 baking sheets with parchment paper. In a large bowl sift powdered sugar and cocoa powder. Whisk in salt. Add egg whites and vanilla and whisk until combined and batter is smooth. Stir in chocolate chips and almonds. *Chill batter in refrigerator for 1 hour to help prevent spreading in the oven. Using a medium size cookie scoop, portion out 12 cookies on each baking sheet. Place 4-5 marshmallows on top of each cookie. Place the baking sheets in the freezer for 5 minutes (or fridge for 10-15 minutes) to chill cookies to prevent them from spreading too much in the oven. Bake cookies for 12-13 minutes. Allow to cool on the baking sheets for at least 5 minutes and then transfer cookies to wire rack to finish cooling. Note: My cookies stuck to the parchment paper and were very delicate to remove. Next time I make these I will spray the parchment with non stick cooking spray. yum they do look gooey and pretty good! I know my family will devour these cookies! They look awesome! Oh wow, minus the nuts these are right up Shane's alley! He's always asking for chocolate cookies so he'll be thrilled :) Thanks for the tips, very helpful!! Those cookies look absolutly amazing!! Oh wow that's an amazing picture. They look delicious. The secone last picture just proves the ooey gooeyness! 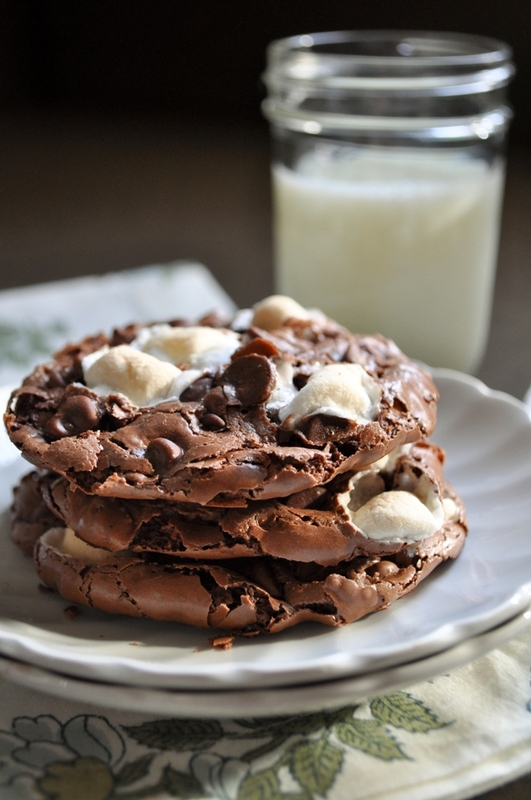 Looks awesome..
LOVE the sound of these cookies - can't wait to make them for my chocolate addict hubby. Thanks for picking such a great recipe! These look like such crunchy cookies which are my favorite kind! Great SRC pick! Wow this is one awesome looking cookie. I do love to make cookies. Great SRC pick. I want a big bowl of vanilla bean and these cookies! What a great choice in recipe! These cookies look incredible! I'm loving the marshmallows - seriously could eat a bag on my own in no time & even faster paired with chocolate! ;) Yum! Gloria, Your comments and what you wrote about me are so, so kind. Thanks so much. You picked a GREAT recipe to try and your cookies look gorgeous...dare I say more gorgeous than mine? LOL. It's funny, I've never had a problem with the cookies sticking to the parchment but I wonder if it's a difference between brands? Who knows. Anyway, I love your blog and hope we can keep in touch!!! Rocky Road icecream is my fave! So, I can only imagine that these cookies are out of this world! Ooey Gooey is a good name for these! They look incredible! Wow...these cookies are AMAZING! I'm a cookie fiend...and these are making my mouth water! Great being in SRC Group C with you! OMG - these look and sound amazing. I just wish I had a few right now to enjoy. Glad to be part of SRC group C with you!! Holy smokes, Gloria, you are totally going to have the most popular post in group C this month! This is insane and I so have to make these. Wowza, just amazing. That cookie is everything a cookie should be. I might just make some and top them with vanilla ice cream, way over the top! Thanks for the tips on the stickiness and cooking time. This is exactly how I like my cookies! They look delicious! I've made these before and had a lot of trouble getting them off the parchment paper- after struggling with the first cookie sheet-ful I discovered that popping them in the freezer for a few minutes makes them MUCH easier to peel off the paper. Next time I get a chocolate craving I'm going to try this yummy cookie. Great SRC recipe choice.! wow, I love the texture of these cookies! They look absolutely gorgeous. Fun pick for SRC! Oh my word you cookies look amazing, please send me some! Making them now...will post the outcome...only thing...is the batter suppsed to be runny??? Cool! Yes, the batter is runny. Check out the link back to Joanne's blog. She has a picture of the raw cookie batter on the cookie sheets. Because the batter is runny you should pop your baking sheet in the fridge or freezer to let them firm up a bit. This is supposed to prevent the cookies from spreading too much during baking. Good luck! Let me know how they turn out. I find the issue with the recipe is that they tell you to just put the egg whites into the dry ingredients and beat. This is a meringue-based cookie, so you should be beating the egg whites to stiff peaks beforehand and only then folding them very gently into the dry ingredients (and folding the chips and nuts as well) - this takes some time, probably at least 30-40 folds but it's worth it. I was not impressed actually...and since I doubled it, it was more upsetting. They were sloppy and did not work well for me.... I'm sorry but I would not recommend these! I haven't tried freezing the dough so I'm not sure. I'm thinking they may not freeze well since they are flourless and don't contain fat. I just made these cookies this evening. They do have a wonderful texture, but I would add less chocolate chips and more almonds next time. I would also recommend greasing the parchment paper beforehand, as the cookies tend to stick to it. Thanks for sharing the recipe! Has anyone tried putting them on a silpat? I absolutely love these! If you want them to be the right consistency, make sure that you beat the whites first for a few minutes, then FOLD very very gently into the dry ingredients otherwise they won't look as great and will be too liquid. Thank you for the tip Natalie. That makes perfect sense to beat the egg whites into peaks first. I will give this method a try next time I make these. Hope you had a happy holiday! I don't think they are gluten free. They would go well with my muffin top. Could you recommend a vegetarian alternative for the marshmallows? I could buy veggie ones off the internet but they are so expensive! Thanks for this lovely recipe! Keeping the batter chilled as much as possible will help keep the cookies spreading out too much. Chilling the pans assists further, so I do recommend doing both. The batter is very loose so smaller portions should help. Promo 100% is Back! Royalflush99 memulai kembali promo 100% deposit yang sudah ditunggu oleh para pecinta RoyalFlush99. UNTUK PARA PEMAIN BARU DAN PEMAIN LAMA.. If you or one of your family or friends has a birthday coming up, you may be already thinking about one of the most important parts of any birthday celebration - the comfort food Whether you are young or young at heart, having a wonderful birthday cake is one of the best parts of turning another year older. You see, taking care of dogs is not much comfort food recipes to do especially when you know how to treat them well. Opening a home based dog bakery business will not only help you give your favorite pets a yummy treat but you can earn extra income out of it. It is like feeding your dogs, but instead of spending for their food you actually get extra money out of it.